The points were shared at The Old Spotted Dog as Clapton and Hoddesdon Town drew 1-1. Giovanni Palmer netted for the hosts but Connor Bolton also replied for the visitors to see the points shared, leaving The Tons in 12th and the visitors two places higher. The Foxes are into 9th after they saw off Stanway Rovers at Cricklefield, although they had to come from behind to do it after Tyler Kemp put the visitors into a 17th minute lead. Alejandro Barber levelled three minutes later though and then in the 67th minute Ilford took the lead when Lamarr Douglas netted from the spot, and they sealed the points with fifteen minutes left thanks to a free kick from Callum Maltese. Stanway are in 15th after this result. The Motormen are 11th after they saw Daniel McCullock net a 71st minute winner against bottom side Leyton Athletic and bounce back from their heavy home defeat last weekend. Defeat for Leyton sees them remain two points behind Barkingside with just two games to go. Hamlets put in another superb away performance, making it back to back wins on the road, after they defeated an out of form Sawbridgeworth Town at Crofters. Ijahl Currie-Wilson netted twice before Georgio Exakoidis sealed the points, and it meant Hamlets climbed above The Robins into fourth bottom. Manor made it four straight wins as they continued their terrific end of season form with victory over Sporting Bengal United at Southchurch Park. Manor opened the scoring after an hour through William Purdy before doubling that lead in the 73rd minute through Harry Rogers. And then that man Michael Ogboin netted yet again to seal the points for the hosts two minutes later. Sporting, who saw manager Imrul Gazi start and play alongside his son Raul, netted a consolation through Ashaan Siddik late on, but it was too little too late for the visitors. The Airportmen remained in the title race after they came from behind to defeat Woodford Town at Hargrave Park. Asher Modeste gave the visitors a 20th minute lead but Sam West levelled things up on the half hour mark. And then in the 65th minute Rob Norris netted what proved to be the winner for the hosts, meaning they remain two points behind leaders Hullbridge Sports with two games to go. Hosts defender Bryn Thorpe hit four as his side smashed eight past a hapless Barkingside at Station Road. Thorpe gave had side a fourth minute lead before Andre Humphries doubled that lead in the 20th minute, but Side got themselves back into the contest when David Ottley pulled one back on 25 minutes. Early on in the second half though Thorpe and Dan Hawkes added further goals for the home side before Ricardo Bailey was sent off for the visitors, and then the floodgates really did open as Thorpe completed his hat-trick with fifteen minutes left before Ryan Lynch made it six with five minutes to go. Thorpe then added his fourth and Takeley’s seventh two minutes from time before Lynch added a second of his own to complete the scoring in stoppage time. Takeley did cement at least a 5th placed finish with this win, whilst Side remain second bottom, two points ahead of Leyton Athletic. Stow are now officially out of the title race despite them thrashing St Margaretsbury at Wadham Lodge. 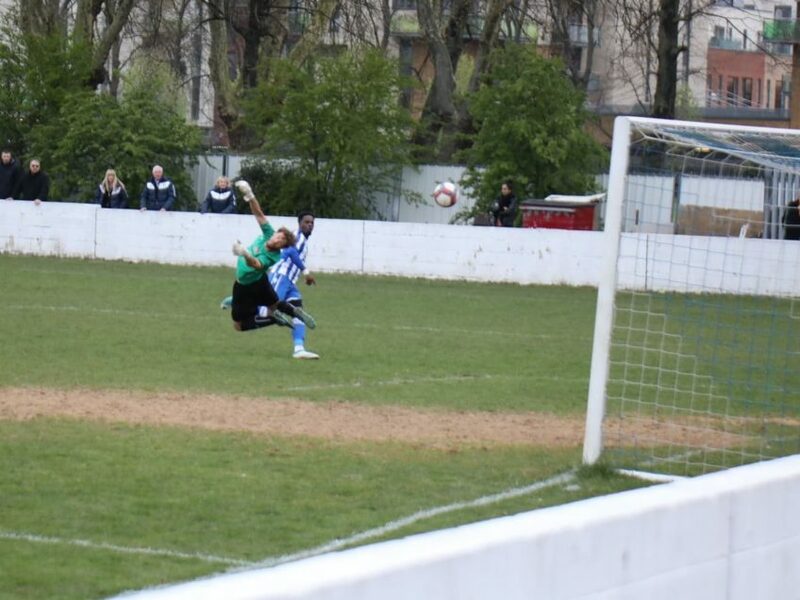 Hullbridge’s win at West Essex meant it is now not possible for the hosts to catch the leaders, but they wanted to sign off their home season in style and after Dwade James had missed a penalty, he did give the hosts the lead right on half time. Kieran Bishop then added a second midway through the second period before Nick Symonds added a third seven minutes later, and then Tage Kennedy capped a fine performance with a fourth in stoppage time. Defeat for the visitors sees them remain in 8th spot. Hullbridge Sports have secured their highest ever finish and know they can win the title with a win in their next game after they saw off West Essex at Mayesbrook Park. An own goal put the visitors into a 27th minute lead before Yemi Adelani sealed the points midway through the second period, and it all means Sports maintain their two point lead over Stansted with two games to go. And with this victory, the title race is now down to just two sides – Hullbridge and Stansted, after Walthamstow and Saffron Walden Town saw their challenges ended today.